Many women who are considering removing their breast implants often ask if they should also remove the capsule surrounding their implants. The capsule is the “scar tissue” that the body naturally forms around the implant in every patient that has a breast implant. This capsule is, in essence, the result of the body’s natural defense mechanism to protect itself from something it recognizes as foreign. Anytime any foreign material is implanted into the body, whether it be a pacemaker, a medicine port, or a breast implant, scar tissue is created around the foreign material. When talking about breast implants, this scar tissue is what is referred to as the capsule. In most cases, the capsule that surrounds the breast implant is thin and filmy-like, with essentially no substance. However, in certain circumstances, the capsule can be thick and physically apparent. 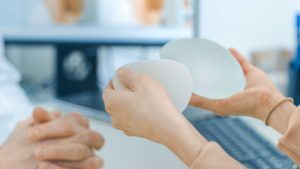 This is most commonly seen in capsular contractures that are the result of broken or leaking silicone implants, or in long standing saline breast implant capsular contractures. In these cases, the capsule should be removed along with the breast implant. The medical term for this procedure is en bloc capsulectomy. In the case of the broken silicone breast implant, en bloc capsulectomy is performed both to ensure that all of the extruded silicone material is removed and to allow the breast to revert to its natural shape. When the capsule is thick from a broken silicone implant or from a long standing capsular contracture from saline implants, en bloc capsulectomy is important because the capsule is often like a paper-mache and maintains a form even after the implant is removed. If a new breast implant is to replace the old implant and such a capsule is not removed, the shape of the new implant will be compromised by the remaining capsule. If there is no implant replacement and only the implant is removed, but the capsule is “paper-mache-like”, the remaining breast form will also be adversely affected if the capsule is not removed and en bloc capsulectomy is not performed. However, for most initial capsular contractures, a simple capsulotomy and not en bloc capsulectomy is most appropriate and effective. En bloc capsulectomy is also the main treatment modality for Breast Implant Associated Anaplastic Large Cell Lymphoma (BIA-ALCL), a rare and highly treatable lymphoma that has recently been in the news because of its association with breast implants. BIA-ALCL is not a type of breast cancer, but rather, a cancer of the immune system. It is only associated with textured (rough surface) implants and has never been encountered in smooth implants. The current estimations of the lifetime risk of this illness in women with textured implants is somewhere between 1 in 3800 to 1 in 30,000 women. There is no scientific data to suggest that en bloc capsulectomy in patients without BIA-ALCL gain any systemic health benefits. This is an important point because en bloc capsulectomy is a significantly bigger and longer operation than simple implant removal and/or capsulotomy. En bloc capsulectomy can adversely affect the blood supply to the breast, which in turn can lead to wound healing problems with the breast, which can then lead to a poor cosmetic outcome. En bloc capsulectomy may also lead to an increased chance of bleeding post operatively, which may require additional surgery to address. In the appropriate patient, en bloc capsulectomy is an excellent and safe operation. However, en bloc capsulectomy should certainly not be used in all cases of breast implant removal or replacement. For more information about revision breast surgeries, we invite you to contact Weston Plastic Surgery to schedule a consultation with Dr.Rothfield.